In an interaction with Restaurant India, PK Khurana, Owner at Cafe Jade talks about his love for food. What led to the birth of Café Jade restaurant? We have been a family of food lovers. We appreciate the art of beautifully made and well cooked food. Also, my daughter-in-law who is gluten intolerant turned out to be a blessing in disguise for us. She found it hard to choose from a limited number of choices at marriages, parties and family outings, which gave birth to the idea of setting up various allergens free foods. So, with passion for cooking and diversifying like none other, we decided to set up an authentic Thai and Chinese restaurant which marked its difference by catering for all sort of allergies and food conscious eaters. We have specialized with gluten-free, sugar-free, dairy-free, nut-free, and low-calorie food items. Leaving behind your job at the newspaper what made you start a restaurant? Having a restaurant has always been on my mind. I quit my job as Director-Marketing in 1999 and went on to start QuikRelations – A leading public relations company servicing clients’ pan-India. 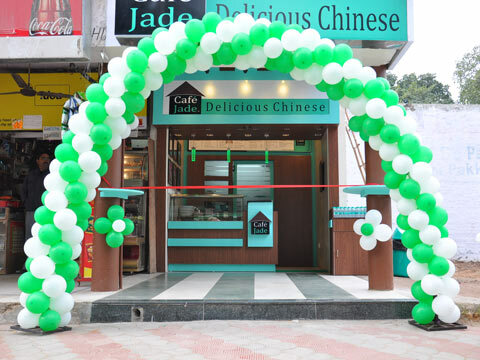 When I thought that I could diverge from my existing business, I ventured out to pursue something that has been my dream since long time and Café Jade came into being. How was the funding done? We haven’t looked out in terms of funding as this has been a self initiated venture. We have successfully completed our first year operations and have remained bootstrapped by choice until now. Our sincerity paid off when we became profitable in our sixth month of operations. Once we expand into establishing our own line of products to be used while cooking Gluten-free food we will look forward to get funding to fulfil our growth plans. Why did you choose Chandigarh as a location? Since, my family has been living in Chandigarh; this has been my choice by default. Apart from that the city is vibrant and full of young energy. The city is developing at a fast pace and people are open to trying various cuisines and that’s what we love to bring to them. As you are serving Chinese & Thai food at Café Jade, how do you see the market in Chandigarh? The tricity (Chandigarh, Panchkula and Mohali) are emerging business areas and that increases the number of job opportunities in the region. A lot of young professionals are moving to the city and have been our ideal target customers. Also, the fact that we have ventured out into making various allergen-free food we have a different and special customer base for us. What according to you is the reason behind Chandigarh becoming top location for food brands? Chandigarh is the hub of youngsters from all regions who come here seeking professional and personal growth. Couples who have been occupied in their jobs and have less or no time to cook also prefer to eat at a hygienic and well priced place. They are open to trying different cuisines and also love to experiment. Our low-calorie options have gained tremendous popularity amongst weight watchers and we have a large community of people who have become our regular customers for gluten free foods. After the successful operations of Café Jade, we have initiated many expansion plans. We plan to expand at various locations in the tricity. We have run Café Jade as a systems driven company that runs smoothly even without the promoter's physical presence at the Café. Our meticulously developed systems make the management free from day-to-day operations. QSR food shouldn't be known to be unhealthy..